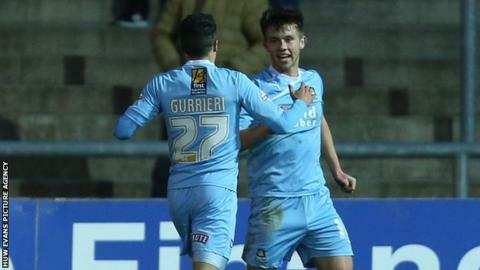 Plymouth boosted their League Two play-off hopes with their first win in four at mid-table Newport. Tyler Harvey's powerful header from Nathan Thomas' cross put the Pilgrims in front. Former Argyle striker Chris Zebrowski levelled from an awkward angle following Ryan Jackson's through ball. Conor Hourihane's finish from a counter-attack sealed the win and moved ninth-placed Argyle to within two points of York in seventh. "The main thing now, at this stage of the season, is just getting three points. "I thought we worked very hard and we probably deserved it. "We scored two excellent goals but I was disappointed about their goal." Corner, Plymouth Argyle. Conceded by Robbie Willmott. Ryan Burge (Newport County) wins a free kick on the right wing. Attempt missed. Conor Hourihane (Plymouth Argyle) right footed shot from outside the box is too high. Foul by Rene Howe (Newport County). Substitution, Newport County. Ryan Burge replaces Michael Flynn. Attempt missed. Nathan Thomas (Plymouth Argyle) left footed shot from the centre of the box is close, but misses to the left. Substitution, Plymouth Argyle. Dominic Blizzard replaces Tyler Harvey. Paul Wotton (Plymouth Argyle) wins a free kick on the left wing. Attempt missed. Reuben Reid (Plymouth Argyle) right footed shot from the left side of the six yard box is close, but misses to the left. Attempt missed. Conor Hourihane (Plymouth Argyle) left footed shot from the left side of the box is close, but misses to the left. Corner, Plymouth Argyle. Conceded by Ryan Jackson. Foul by Max Porter (Newport County). Substitution, Plymouth Argyle. Enoch Showunmi replaces Marvin Morgan. Andrew Hughes (Newport County) wins a free kick in the attacking half. Attempt missed. Michael Flynn (Newport County) left footed shot from the centre of the box is too high. Marvin Morgan (Plymouth Argyle) wins a free kick in the attacking half. Attempt missed. Max Porter (Newport County) right footed shot from outside the box misses to the left. Christian Jolley (Newport County) wins a free kick in the defensive half. Substitution, Newport County. Christian Jolley replaces Lee Minshull. Substitution, Newport County. Rene Howe replaces Shaun Jeffers. Attempt missed. Kevin Feely (Newport County) header from very close range is close, but misses to the right following a corner. Corner, Newport County. Conceded by Andres Gurrieri.